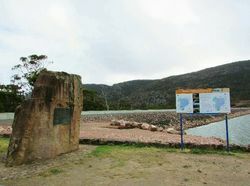 The plaque commemorates the official opening of the Lake Bellfield Water Storage. The Premier of Victoria Sir Henry Bolte unveiled a commemorative bronze plaque set in a 10-tonne rock which was excavated during the dam construction, to officially open the Lake Bellfield water storage. 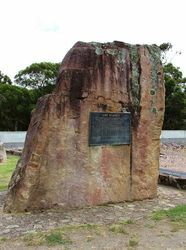 Other dignitaries present were The Minister of Water Supply, Mr Borthwick; President of the Stawell Shire, Cr M. D. Rahley and The Member for Ballarat Murray Byrne. 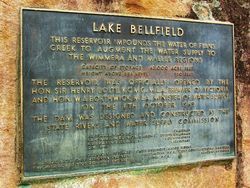 Mr Borthwick announced that the Government had approved the temporary diversion of the upper 15-square kilometres of the Wannon catchment to Lake Bellfield, subject to four conditions.